Li describes his approach to painting as something akin to a “computer programmer” scripting games on canvas. Inspired by a genre of video games where the player looks for minute differences between two photographs, Li’s Wedding is part of a series of diptychs that explore the authenticity of documentation. 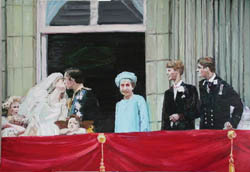 Picturing the famous Charles and Diana balcony scene, Li’s rendition supplants the original event, rewriting the image to include William and Harry, highlighting the malleability of collective memory. Li faithfully depicts the image as pixellised to reference its internet source and question issues of appropriation, falsification, the idiosyncrasy of the artist’s hand. There are six dissimilarities between the two canvases, including the insertion of a Raphael cherub in the group of princesses, and star emblems on the royal banner. Since 2000 there has been an increasing curiosity by the international community in the astonishing speed of China's emergence on the globe as one of the key players and a potential competitor of the American superpower. This situation will not only enable the international framework to reshape itself, but also makes China become more uncertain in terms of its social, cultural, and political prospects. Thus the world is shifting its attention to the young Chinese generation who is born into earlier 1980s, and who have grow n up with the open and reform program. Their attitude will be an important reference to China's palpable future. As the most sensitive group of this generation, Chinese young artists' creation is perhaps the parameter to foresee China's tomorrow. In the Chinese art world, one of the most obvious phenomenons in recent years is the coming of age of many young talented Chinese artists whose art practice is recasting the conventional appreciation and perception which is dominated by Western art establishment. This forces international commentators to re-examine the new art without a prejudice. No longer reflecting back to the ideological-charged western projection and imagination of China, they pay attention wholly to current social reality- to capture the nature of a changing and uncertain life and that contemporary Chinese art is down to the earth. Li Qing (born in 1981 in Zhejiang province) is a graduate student at China Academy of Art and one of the representatives of this new generation. Over the last few years his art has been included by many important exhibitions and rewarded several grants and awards, due to his excellence of performance - the mastery of refined and personal technique, the wide social concerns, and the appropriate representation. 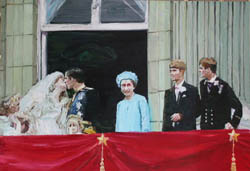 Executed in the very traditional medium of oil on canvas, the generally mid-size paintings are usually paired pictures.